Woah! Its been a hot minute since I wrote a house update. It is more than time to update you guys on the process and I couldn’t be more excited. Every time I go in the house now, it feels like Christmas morning. It is so exciting to watch everything come to life. So much has happened since the last update, so I am sure I will leave a few details out, but I will try not too! 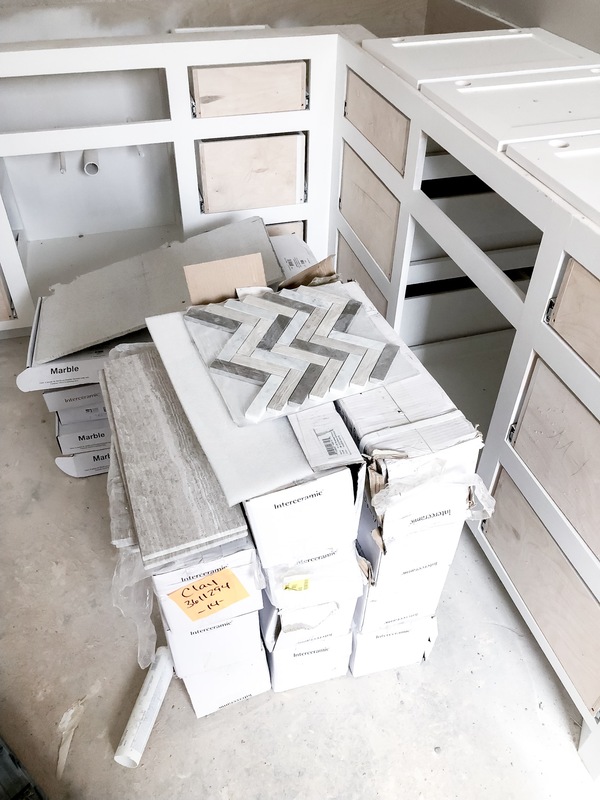 In the past month, all of the woodwork was finished, the brick work was finished, we selected our paint colors, painting finished, we selected our counters, we selected our carpet and all of the tile work is in progress. In my last post, I mentioned how fun it was designing the closets and they couldn’t have turned out better. Our stair rail was finished and kitchen cabinets were finished. We had a slight hiccup in the kitchen because the cabinets were made oversized at first, but they took them down and remade them to correct size fairly quickly. My original kitchen design had to change slightly, but overall I’m really excited about how it looks. I can’t wait to get the cabinet doors put back on and counters installed to start seeing the final product. Once wood work was complete, the painters came in. We really like our painters. They are super nice and really funny. We had to decide on our outdoor paint colors last year when we turned in our application to the POA so the outside was pretty simple. The outside is painted with Pavilion Beige and the black accents are Tricorn Black (all paint is Sherwin Williams). When you travel to the inside, you will find Alpaca on our walls and High Reflective White on all of the trim, doors, cabinets and ceiling. This part was fairly easy as well because friends of ours just painted their house in Alpaca so we knew that was the color we wanted. All we really had to decide on was the shade of white. Brooke declared she wanted a pink room, so i’m pretty sure she’s not going to be happy with the grey-ish color. Girl friend has even picked out pink carpet! Yeah – its not happening. While all of the painting was being done, our brick was also finished and our house number was installed. Next, we selected our counters and carpet. We originally though we were going to go with granite throughout the house, but after a few minutes at TCS Flooring and Design, we knew we wanted quartz. Kevin and I both just want a really crisp feel and the quartz was calling our name. Needless to say, we blew that budget out of water. We ended up selecting WilsonArt Northern Cascades for our counters. We also selected our carpet from TCS and went with a very subtle, soft one. TCS Flooring and Design also started installing our Interceramic tile. They sell the Interceramic brand, so it really was a perfect match! Throughout the process, we were also working on our tile design in terms of the decorative tile patterns in each room. We went back and forth on things a few times so I am excited to see how they come out. Also, when I saw our floors laid out, I may have freaked out – I just LOVE them so much!! During Black Friday weekend, we ordered a ton of items. We decided on our main ceiling fan, ordered it and ordered all of our bedroom ceiling fans. We also decided on all of our door hardware and ordered the exterior locks for the house. It took some shopping around, but we also found bar stools that we really like for the new kitchen island. I am hoping they will look just as good in the room as they do in my head. We also ordered our kitchen faucet and a new bedroom comforter. Basically, we are making decisions and ordering all of the finishing touches on the house. It is such an exciting time and we only have a few decisions left to go before the house is complete! I know I say this every time, but I CANNOT WAIT to live here!! Someone is going to have to pinch me, I can’t believe this is our house.